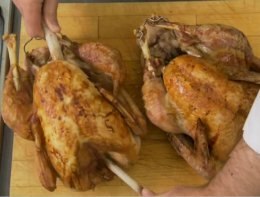 If you’re tired of having a tasteless, dried out turkey for your holiday meals and finally want a flavourfull bird everyone will be raving about for years to come, try soaking your turkey in a brine solution overnight. Brining a turkey is probably the simplest and easiest way to add flavour to any holiday meal. Make sure you make your brine mixture 2 days before you’ll actually be cooking your turkey! First of all, fill up your large cooking pot with at least 2 gallons (8 litres) of cold, fresh water and put it on the stove on the highest setting. Now pour in your kosher salt and brown sugar. A general rule of thumb is to add one cup of each per gallon of water used. Next throw in your bay leaves, peppercorns and garlic cloves. Then bring the whole thing to a boil while stirring occasionally. Boil the brine mixture for about a half hour to make sure the pepper, bay leaves and garlic have had a chance to infuse the liquid nicely. Remove the pot from the heat and let it cool for a couple of hours before putting it in the refrigerator overnight. The next night before you go to bed, wash off your turkey under the faucett and remove anything from the inside, like the neck and giblets. Put your turkey in the cooler and pour in your brine mixture, making sure that the entire turkey is covered with liquid. Then pour in the bag of ice and place the cooler in a cool place like your garage or basement. Leave it in the brine solution for about 9 or 10 hours and no more or it could be damaged beyond repair. Then take the turkey out of the brine mixture and dry it completely with paper towels, inside and out. Place it into your roastpan and keep it in the refrigerator until you’re ready to put it into the oven. Be sure to clean and disinfect all the tools and utensils immediately after using them and don’t forget to wash your hands thoroughly after touching raw meat of any kind, especially poultry. Of course, there are many variations you can use when cooking just about anything. As a rule though, one cup of kosher salt and a cup of sugar per gallon (4 litres) of water is best. The other ingredients of the brine mixture are optional and can be experimented with depending on what your tastes are.